At Intelligent Management, we guide organizations to understand operationally that they are a network of projects with one shared goal and not a collection of disconnected pieces . design, manage, measure and develop their organizational system. We introduce a powerful Thought Process to guide companies and individuals to build a cause-and-effect, concise cognitive picture of their current situation of blockage. Together, we then develop robust solutions for significant improvement. 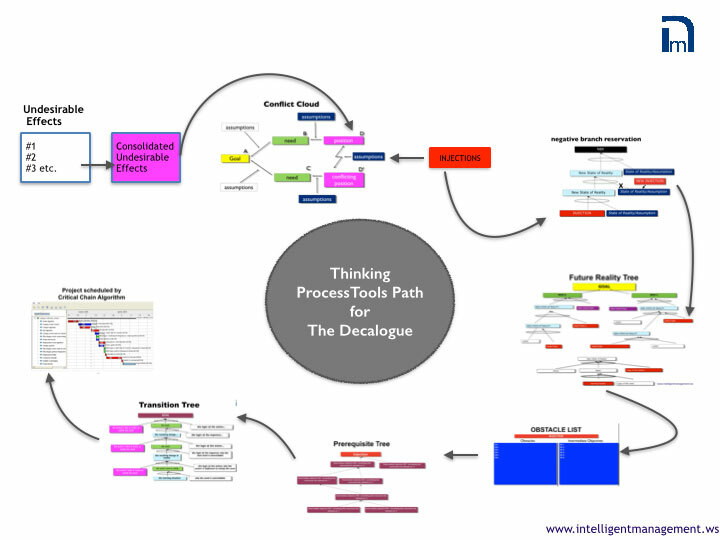 By leveraging the Ten Steps of the Decalogue management methodology for systemic management, we help the shift towards a systemic reality that overcomes problems originated by fragmentation and silos. Our education modules are built holistically to guide people along a planned path of transformation. The outcome is a shift: from a world of separation and local optima to a reality designed to radically improve the quality of processes and interdependencies. This leads to creating more harmonious interpersonal connections and ensuring a smooth flow of delivery of products and services. By working with Dr. Lepore I have learned to systematically reframe issues to reach breakthrough.” Livio Brachetti, CEO Social Nation & Owner, Cuordimela. With this process, we now have a clear path we can execute with confidence. Bob Maccario, VRWPA. Our leadership team benefited a great deal from working with the Intelligent Management team, providing a powerful set of tools and training for us to use across a wide range of issues planning. ” Eaton Dunkelberger, CEO, Sierra Nevada Journeys.